They were partners before they were friends, but today they look like a couple. Their job is to look for elegant getaways from cliches. And they accomplish through constant research a new way of art beyond plain fashion. He plays with a piece of green cloth. He stretches it and then squeezes it. He invents an embroidery. Unhappy with the results, he undoes it and tries again. Something will turn out of the cloth, he suggests with a stubborn look. Jessica Trosman and Martin Churba don’t know for how long they’ll keep on doing the things they do today, but they don’t want to find out yet. They have fun sharing their jokes with the occasional outsider in exchange of his complicity. Very soon, one gets to know their crazy ideas, and the sane ones, the certain projects, and the yet unknown ones. They are connected. Friends, soul mates, husband and wife, clones, two oranges. It doesn’t matter how they call their relationship. When they had to be lettuce and corn, they did it. They live comfortably inside their shelter and collect memories to fill an eager box of surprises. At first sight they may seem opposite, and maybe they are. He hangs his pose of “enfant terrible” with pride and she plays the part of the languid mother who knows him so well. Jessica and Martin found each other four years ago. When you see them, you think they were always together. A whole lifetime. Actually, they were introduced by a mutual friend who insisted on “introducing us ‘cause we did similar things and were going to get along very well. And she was right. One saturday we met and next monday we were already working together”, comments Jessica. Apparently, it was a strange case of love at first sight, because “the thing was working for both of us, we saw each other’s work and loved it. The interesting part is that each one of us is an orange. Martin puts the whole of him in the project and so do I”. He affirms that “as we were self taught, we are also very self sufficient. We are together by decision, it was never compulsive. That is the mark of our project”. They almost seem in love, especially when he tells that “these things can be felt, like when you find your soul mate. Although I didn’t know if it would be important, something inside me felt right. There was a strong energy”. The energy flows between their silently dedicated looks. Martin says “we are like family, without the complicated matters of a family enterprise. Actually, we are not brother and sister, even when we feel like it. Other people would be a couple if they were in our shoes”. Martin’s cloth has found a wire and knits around it a wide range of possibilities. He met the support he needed. Now the cloth stands for itself, silently looking for something still unfound. From the beginning, Trosman Churba has had a similar level of participation in both national and international markets. Their first local fashion show, in the city of Mar del Plata, was immediately followed by an invitation from italian L’Ofizzio per la Moda to show their collection at the Piazza di Popolo in Rome. This show was a break point in their career. They confess at that stage they were “very effective, we made clothes that wouldn’t easily sell today. Photographic and metallic cloth, flying aprons, balloon bags, reversible fabrics, lettuce interiors. The strong dish was our top grabbed with electricity hooks and full of reels. We showed the colours of the garden: corn yellow and strawberry”. At that time, “everybody started calling us, they wanted to sell our collection throughout the world, and lots of mags interviewed us. We could’t sleep, we were so nervous! That’s where it all began”, tells Jessica, with a slightly nostalgic smile. Then, success came very soon. 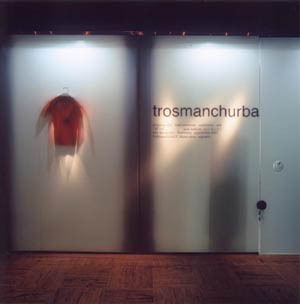 After the show in Rome, Trosman Churba started selling their garments in different countries, such as Greece, Russia, Spain, Japan, USA, the United Kingdom and Switzerland, among many others. 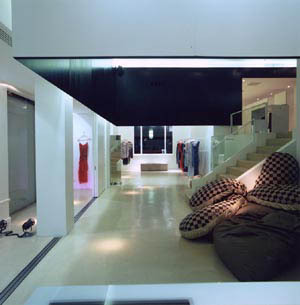 While the demand of foreign countries kept growing, T/C opened the first store in Buenos Aires, in Octubre 1999. “Our identity evolves as the enterprise grows”, adds Jessica. “For example: I’ve always been stubborn, like a little animal. The clothes probably show that, so there is a coloured animal, a plain one, and a textured one”. Trosman Churba print their mark in constant research of work on clothes. Their job goes beyond tailoring. It relates to a combination between many different artistic elements. As Jessica explains, “it’s nice to change our perspective and see ourselves in other artists. I get excellent ideas from other artists’work. Fashion opens up a research field towards art itself”. 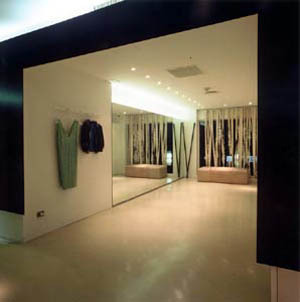 That’s what the fall-winter 2002 collection shows. It reinterprets the pictorial work of Kenneth Kemble: “it is a matter of verbe, graphics, scribbles, the multiplicity of messages, the simple need to communicate something above all”, explains Martin. The chosen ones for next spring-summer 2003 collection are peruvian artist Martin Chambi and photographer Nan Goldin, from whom designers have picked “images, a way of life, the energy”. That is why they are able to find inspiration “in a picture, some texture, anything that happened to us, an image of unique beauty, masculine or feminine, a misture of both of them or beauty never ever seen on earth”, describes Jessica willingly, “mistery, a shadow, whatever you feel like…a potpourri”. Jessica and Martin are taming a wild horse. Or at least, they believe it. Four years ago, they got in the fashion world and for some moments the road was placid and some other times, it was very slippery. At first, they thought about “a runaway horse travelling towards XXI century, until he crashes against a post of the pampean plains. Everybody claims they’ve seen him first, and want to be his owners”. At that time, “their major worry was the market and its guts, the eager competition among those who just wanted to lead the way. For them, “many others has disproportionate projects and very few ideas. They searched for new things, but copied foreign ideas. That way it is very easy to crash against the post and sink”. So they chose to differ from the others through “trusting our inner feelings, Martin tells, that evolve while we think thoroughly about the same questions. It’s a continuous work, without inner cuts. But for the outside world we fillet it to make it delicious”. Fashion schedules are tyrant. From Jessica’s point of view, “unfortunately, in fashion we must change the collection every six months. There is little time for analysis and personal self critique. But those are the rules of this game”. Even so, one could never tell what will overcome for them. And more, one can suppose an open and multiple road. For Jessica, her next project could be “learning acrobatics and achieve plasticity for the body and then translate it into art”. For Martin’s realistic perspective, it could be “to integrate design and decoration in our enterprise, why not”. They both agree on going beyond clothes design frontiers and they are already doing it. An example is the recent production of the performance “Milky Tears”, of corean artist Elaine Kim, who uses human hair to make dresses. The continuous work takes place at the Trosman Churba Observatory, the place dedicated to the exposure of “visionary expressions of other artists” inside the store they opened six months ago in a Buenos Aires mall. 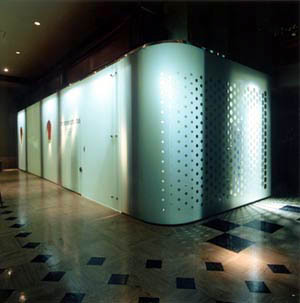 “The pieces of art can be sculptures or video projections. The store is made of translucent glass and the images are projected there, creating the effect of a screen”, Jessica explains. Martin finds the final touch for his green cloth masterpiece. It’s a fragment of emery glass covered in reels and little sequins. He names it “a lamp”, and Jessica decides it already belongs to her. They both celebrate. Meanwhile, in a parallel reality, they are running towards a restless horizon, with the horse as the loyal accomplice. Obviously.